Joanne (Jo) Rupp (in her own words): Newly minted Exercise Science/Sports Psychology graduate of CalU (California University of Pennsylvania), 13 yr veteran examiner for the PA Department of Banking & Securities. I’m a PIAA and USATF track and field official. I’ve been running since I was 10 years old, competitively since 13. At Millersville, I was a three-time PSAC champion at 800m, All-American at 1500m, and in cross country, I was PSAC champ and 3x NCAA-II/ECAC-II champion, and All-American. I’m a three-time HOF inductee (HS, Millersville, and West Shore Chapter of PA Athletic Hall of Fame). Working on my next plan of attack, hoping to teach in the state system, and am awaiting a decision on admission into Pitt’s EdD program for Health and Physical Activity. Check out the episodes of our sister Podcast Moving2Live featuring Don Moxley, released 4/4/18 and 4/18/18. 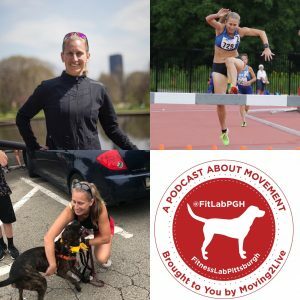 Check out the FitLabPGH Podcast episode featuring Jim Thornton, released 3/11/18. Check out the FitLabPGH Podcast episode featuring John Warrick and Suzanne Natter of the South Park Trail Runners, released 12/3/17.